If the prejudging was anything to go by, the 2008 Ironman Pro would present its share of surprises for several of bodybuilding's established pros', while heralding in some new, quality beef to the upper ranks of the season opener. If the prejudging was anything to go by, the 2008 Ironman Pro would present its share of surprises in the form of low placements for several of bodybuilding's established pros', while heralding in some new, quality beef to the upper ranks of the season opener. Traditionally the Ironman is a show that attracts a large number of competitors all vying to establish themselves ahead of the season's remaining contests. In such circumstances fifty to seventy percent of the pack present far below what is expected at the pro level; these are men - from all corners of the world - are there to test themselves against the best while trying to achieve their personal best. Fair enough. A handful of these men return year after year before they finally break through to the top ten, and of these a few even go on to win. Fifty precent remain out of the money and a source of ridicule for armchair critics like myself. But all deserve immense respect for turning pro and making it to the Ironman stage. They are champions all. Of the usual 30 or so yearly Ironman competitors, less than a handful or so could be considered top tier. The 2008 Ironman once again showcased its usual handful (or two handfuls') of established competitors: men like Toney Freeman, David Henry and Troy Alves. Toney Freeman, David Henry And Troy Alves - Pre-Judging. The only difference was, these men, on this occasion, were forced out of the top order to make way for several future prospects who will undoubtedly become, beyond dispute, major pro bodybuilding stars: namely Phil Heath, Moe El Moussawi and Desmond Miller, first, third and sixth respectively. Phil Heath, Moe El Moussawi And Desmond Miller - Pre-Judging. Always a top threat, Gustavo Badell, in second, signalled his return to top form and positioned himself as an Arnold Classic favorite, while the ever-impressive Silvio Samuel came in fourth with "Mr. Traps" Johnny Jackson in fifth and "Mr. Wheels" Desmond Miller in sixth. Gustavo Badell, Silvio Samuel And Johnny Jackson - Pre-Judging. At prejudging it was obvious Phil Heath would be the man to beat, such was his crisp lines, the additional 15 pounds of quality, evenly distributed muscle he had gained and the winning attitude he presented. For my money it was either Gustavo or Moe in second. The latter was slightly sharper and presented better leg development in my view while the former had a superior upper body and was more vocally and physically aggressive, which strangely enough seems to attract positive attention from the judges (think the 2006 San Francisco Pro where a softer Gustavo beat a ripped to shreds Branch Warren with much grunting from Gustavo's side). Gustavo Badell And Branch Warren - 2006 San Francisco Pro. With the fight for second and third being between Gustavo and Moe, fourth place after prejudging, for me, was Desmond Miller with Silvio in fifth and Johnny Jackson rounding out the top six. Well, that was my interpretation. Here is how it transpired in actuality. gave the fans exactly what they had been expecting several weeks prior: 15 or so pounds of additional muscle on a ripped to shreds frame, complete with jaw dropping arms and improvements to his previous problematic chest. With all of these qualities, along with his usual tremendous X-frame and massive, shapely calves (uncharacteristic for a man of his race), capped off with a deserved air of superiority, Phil was the man to beat. And so it was: a third pro win in as many years for Phenomenal Phil, the man who holds the justifiable moniker, "The Gift". 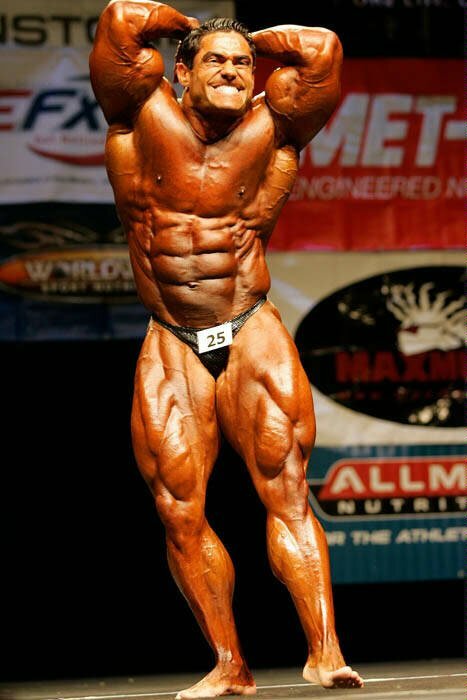 Such was Phil's shape last weekend, many fans, and critics (like myself) predict that Phil will be a major bodybuilding force at the 2008 Olympia. for Phil to climb and with none of Jay's shortcomings and plenty of his own advantageous qualities Phil just might do the Impossible. Let's hope he takes plenty of oxygen. If there were an award for "most vocal bodybuilder while competing"
would be a multiple winner with no direct challengers' in the foreseeable future. It is impossible to overlook Gustavo on any bodybuilding stage, regardless of his conditioning and chance of success: with his perpetual grunting you are drawn to him like whether you like it or not. If this is one of his strategies to ensure he is not overlooked, it works, and whatever works should continue to be done. Look for more grunting from Badell in future contests. Grunting aside, Gustavo backed up his talk of several weeks ago to present an impressive physique with probably his best upper body ever in terms of sheer size. Although somewhat down on conditioning, especially in the lower body, his muscle quality and degree of which, secured him a close second, which he, nevertheless, fought every step of the way for. and it remains to be seen if he can once again hit the top five at either of these contests'.
. From the moment he strode onstage at the prejudging, it was evident he had it all: full muscle bellies, no apparent weaknesses anywhere, ripped, grainy conditioning and great stage presence. Fans and insiders have been talking about Moe for several years' now and most of the discussion has centered on whether he could pull it all together to impress the judges with a physique he had all the potential in the world to present. After last weekend and his best placement as a pro ever, Moe, who lives and trains in New Zealand, can be secure in the knowledge that he is now a viable contender for the top six in any pro show he enters from here on in. He certainly has the muscle and shape to do this. The only thing holding him back has been conditioning. Now he has nailed this aspect of his presentation there will be no stopping him. Good work Moe: statistically New Zealand's best ever, professional bodybuilder. Blessed with some of the best thigh development ever seen on a man his size and a very good V-taper, which conveys the illusion he is larger than he really is, Silvio still lacks the impact to really impress the judges. That he was overtaken by Moe El Moussawi and Gustavo Badell (men who placed below him in the past), while still bringing the shape he presented against these men the last time they met, does much to suggest his star will plummet soon. is always great to see onstage. Thick, full muscle capped off with some of the most impressive traps and shoulders ever seen on any competitor, the Texan is always in the fight. In the comparisons, Johnny looked as wide as he was tall, a massive ball of muscle, no doubt a product of his extensive power-lifting background. However, he does have serious structural leg weaknesses, most notably his poor calves and narrow lower quads. Still, fifth over some impressive competition shows that he is working away making improvements. His conditioning looked excellent from where I was sitting. was another big surprise of the evening, at least in my eyes. Photos taken a few days out from this show presented a gaunt, soft Desmond looking like he would barely make the top ten. What a difference a few days can make to the appearance of a top line bodybuilder? Desmond walked out at prejudging, still below what one feels he could achieve, but nonetheless ripped and very impressive, with legs and arms that were among the best in the show. In fact Desmond's legs could be among the top three in bodybuilding today, such is their overall thickness and shape. Sixth place was a good result for big Desmond.